Each pack contains 3 cards, and each box contains 10 packs. All cards will be in RRR rarity coating. 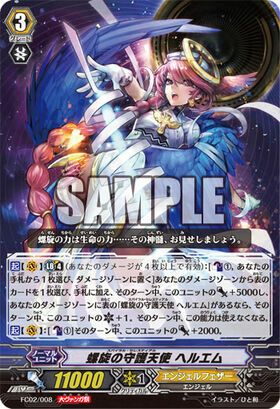 SP rarity cards will be reprints of popular cards such as Majesty Lord Blaster with special flavor text printed. 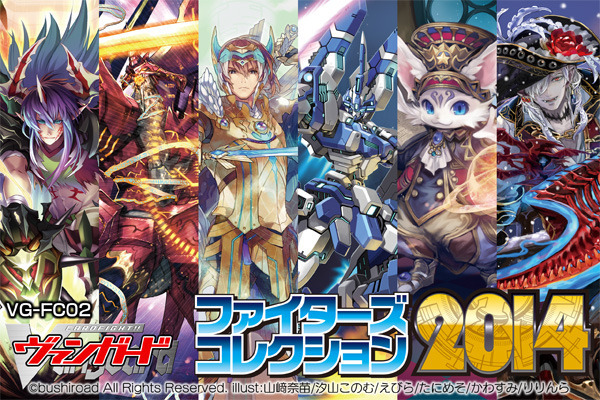 The 30 different cards will include grade 3 cards from all 23 clans (※Excluding Etranger). Out of the 30 different cards, there will be 2 Bermuda Triangle cards (same name and same abilities) with white clothed version and black clothed version. The card ratio will be different from both normal and extra booster sets. Get! Treasure Campaign (formerly Gold Trigger Campaign) will be inside as well. [ACT](VC) Limit Break 4 (This ability is active if you have four or more damage):[Counter Blast (2)-card with "Liberator" in its card name & Choose one of your rear-guards with "Liberator" in its card name, and put it on the bottom of your deck] Look at two cards from the top of your deck, search for up to two cards, call them to separate open (RC), and those units get [Power]+5000 until end of turn, and put the rest on the bottom of your deck in any order. 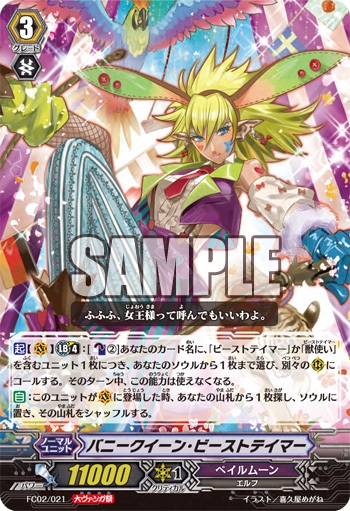 [ACT](VC) Limit Break 4 (This ability is active if you have four or more damage):[Counter Blast (1) & Choose a card from your hand, and put it into your damage zone] Choose a face up card from your damage zone, put it into your hand, and this unit gets [Power]+5000 until end of turn, and if you have a face up card named "Spiral Celestial, Hellm" in your damage zone, this unit gets [Critical]+1 until end of turn. This ability cannot be used for the rest of that turn. 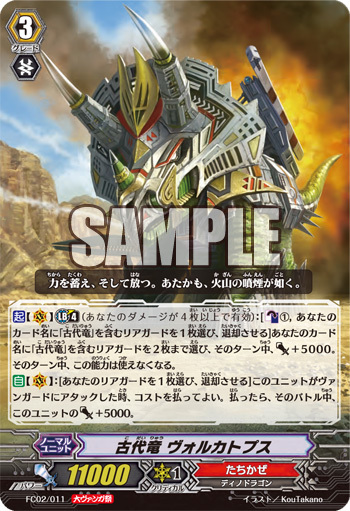 [AUTO] Limit Break 4 (This ability is active if you have four or more damage):When a «Kagerō» rides this unit, choose your vanguard, that unit gets [Power]+10000 until end of turn, and choose up to two of your opponent's rear-guards, retire them, and your opponent looks at four cards from the top of his or her deck, searches for up to two grade 2 cards, calls them to separate (RC), and shuffles his or her deck. [AUTO](VC):When this unit attacks, if the number of rear-guards you have is more than your opponent's, this unit gets [Power]+2000 until end of that battle. 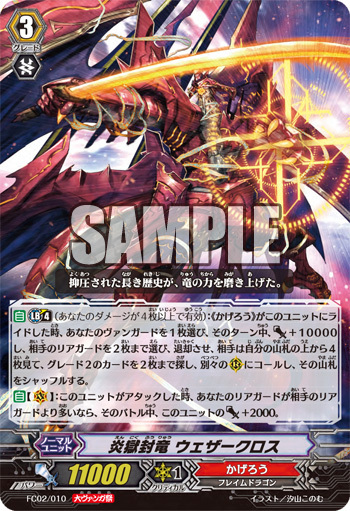 [ACT](VC) Limit Break 4 (This ability is active if you have four or more damage):[Counter Blast (1) & Choose one of your rear-guards with "Ancient Dragon" in its card name, and retire it] Choose up to two of your rear-guards with "Ancient Dragon" in its card name, and those units get [Power]+5000 until end of turn. This ability cannot be used for the rest of that turn. 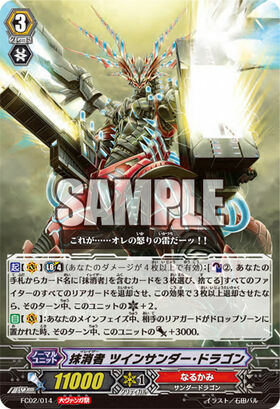 [AUTO](VC):[Choose one of your rear-guards, and retire it] When this unit attacks a vanguard, you may pay the cost. If you do, this unit gets [Power]+5000 until end of that battle. [ACT](VC) Limit Break 4 (This ability is active if you have four or more damage):[Counter Blast (2)] Choose up to one card from your soul for each unit you have with "Beast Tamer" in its card name, and call them to separate (RC). This ability cannot be used for the rest of that turn. [AUTO]:When this unit is placed on (VC), search your deck for one card, put it into your soul, and shuffle your deck. Still upset I don't have my immediately broken Angel Feathers yet. Bushi, I was disappoint. 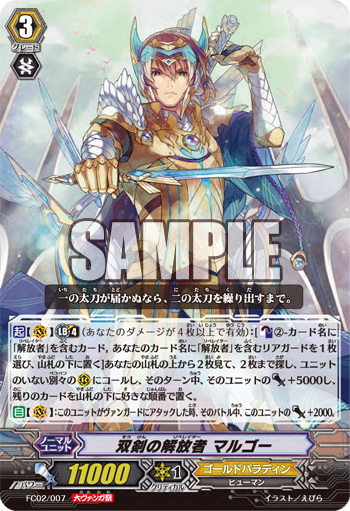 [ACT](VC) Limit Break 4 (This ability is active if you have four or more damage):[Counter Blast (2) & Choose three cards with "Eradicator" in its card name from your hand, and discard them] Retire all of each fighter's rear-guards, if you retired three or more with this effect, this unit gets [Critical]+2 until end of turn. [AUTO](VC):During your main phase, when an opponent's rear-guard is put into the drop zone, this unit gets [Power]+3000.